The Ukrainian banya is a type of sauna that is part of an ancient culture of health and wellness. Most that are built today are constructed more or the less the same as they have been for millennia, consisting of a small sauna room, a small pool full of cold water, and a place to relax, just enough space for a small group of bathers. Born of a 2,000 year old Slavic tradition, banyas were traditionally constructed outside, and modern banyas are often built to mirror or even replicate that traditional outdoor setting. The components of the banya experience are the sauna, the “massage,” and the cold water plunge. 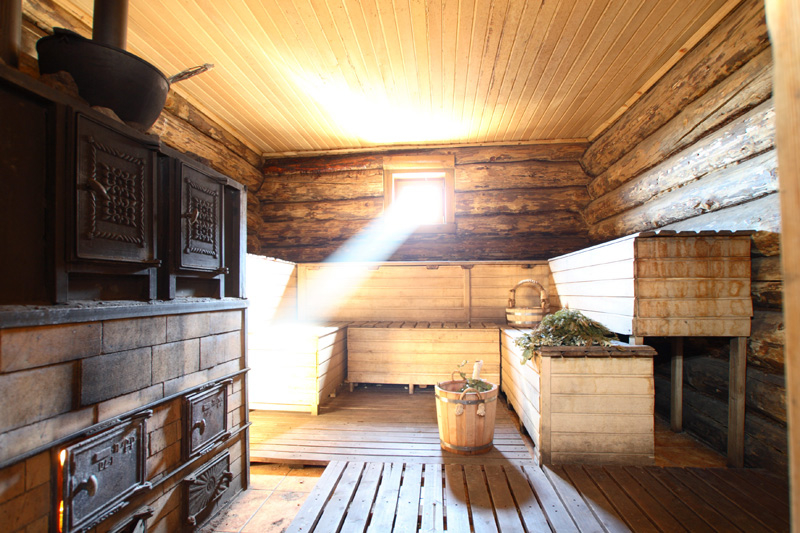 The sauna can be heated as hot as 80 degrees Celsius, and visitors to the banya enter the sauna room before the water is poured onto the hot stones or heating apparatus, for maximum steaming. It gets so hot that a special felt Ukrainian Banya Hat was devised to protect one’s head. Following a solid sweat session of indeterminate length in the sauna is the “massage.” The word is in quotes here because the massage is carried out by someone hitting your naked (or nearly naked) body with tree branches. The dried out bunches of leafy branches, from oak or birch, are called venik and they are soaked briefly in a bucket of hot water and then “applied” to your body in a variety of ways. A “slapping” or “beating” motion is common, but most banya visitors are pleasantly surprised to note that the sensation produced is not primarily one of pain, but of comfort. The purpose of the venik massage is to stimulate the circulatory system and enhance the banya experience, and there’s more of a method to it than just slapping an unsuspecting bather with a bunch of branches and leaves. The massage takes place inside the sauna, and traditionally on your second or third round of sweating and cooling off. While lying face down on the benches, your masseuse will shake the venik over your body, to wet your skin a little bit with hot water. They will then lightly slap your skin with the wet venik, starting from your upper back and working to the extremities, pausing to press the venik into your body at the chest, stomach, and thighs. The branches themselves are reportedly fragrant, not at all prickly or thorny, and are pleasantly warm. After the massage, you’re sufficiently prepped for a dip into the icy water. Some facilities have a showerhead installed for the cold water portion of the banya, but most banyas will have an actual plunge pool in which patrons can submerge themselves after their venik massage. The shock of going from extreme heat to extreme cold in a matter of seconds provides a rejuvenating sensation that explains why people have been visiting banyas for millennia. The cold pool is not a breath of fresh air per se, but the feeling of bodily euphoria after getting out can be incredible, and last for a while after the experience. True banya devotees will repeat each part of the banya multiple times, pausing either in between cycles or afterward to rest and enjoy drinks, snacks, and even possibly a nap. It’s worth noting that banyas predate similar nationalized experiences like Korean bathhouses and Finnish saunas, and are especially distinct from any sort of American “spa” experience. In most American spas, pampering oneself is an isolated experience with no communal element whatsoever, and is done largely for cosmetic reasons. There is nothing comparable to a true Ukrainian banya, so we can only be grateful that they continue to exist and thrive in the interest of our full mind-body betterment.